What Am I Doing With This LLama!?? This painting represents that moment when you suddenly realize that nothing in your life is what you expected or planned. When you suddenly turn around and realize: What am I doing with this Llama!?? This painting has been sold and is in a private collection. 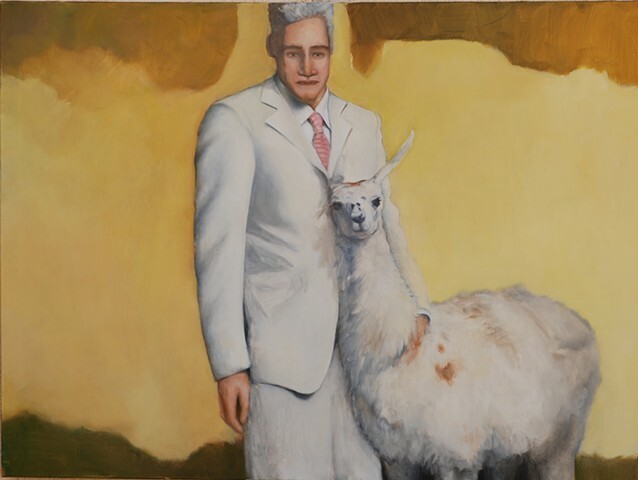 oil painting, magical realism painting, figurative painting, animal painting, painting of llama, figure painting, yellow painting, modern figurative painting, modern figure painting, contemporary figure painting, contemporary figurative painting, realistic painting, realism painting, white painting, painting of man in white suit.